mad tasty: October 18 is National Cupcake Day! 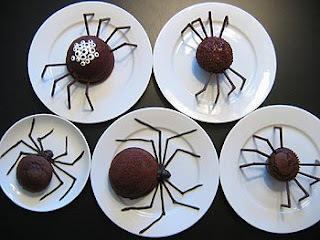 These spider cakes via not martha are a great idea for Halloween. I am a fan of the googley-eyed spider cupcake. Kinda scared of the more realistic looking ones. 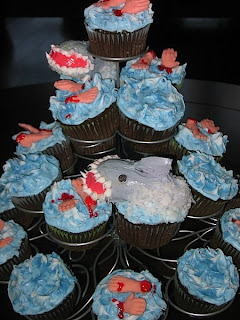 Another cupcake theme that would be great for Halloween is the shark attack cupcake mountain via craft. OK, enough of the nightmare inducing treats. Moving on, you can always opt to embellish your otherwise standard cupcake with such ornaments as miniature plastic animals. 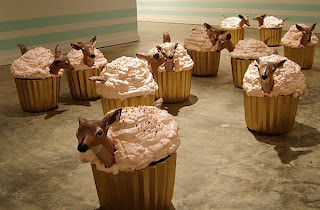 Check out Andrea Canalito's cupcake fawn sculptures. Whatever you do for National Cupcake Day, be sure to use your discretion. For example, cupcake cakes can are an occasional do, but a more frequent don't. See cake wrecks for more tasty treats gone wrong. the spiders don't really do it for me but the sharks and the deer are AMAZING. This would have been the perfect day to dive (no pun intended) into our new fave decorating book, Hello Cupcake!